The cut point of 10 in or 12 in desander is 40 ~ 45 um and that of 4 in and 5 in desilters 20 ~ 25um. Since desanders and desilters would discard large amount of barite along with the drilled solids in a weighted mud, therefore they are usually used only with unweighted mud.2 in desilters can be optionally used for removing even finer particles (7 ~ 10um) of the underflow of the upstream desilters or mud cleaner. Number of hydrocyclones: the number of desanders arranged in a set for a rig is determined in the way that the capacity processed by the defined number of hydrocyclones of a set of desanders must be equal to 125 % of the maximum rig circulating rate or more. A number of hydrocyclones in a set of desilters must process 150 % of the rig maximum circulating rate. (2) Solid content of the underflow of the preceding equipment or solid content of the mud that gets into the inlet of this unit. 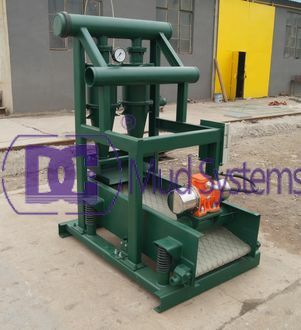 As the first-level solid control equipments in the drilling fluid process, the shale shakers first clean up the larger solid particles in the drilling fluid which returned from shaft bottom, it is fit for the screening of various kinds drilling fluid. Shale shaker is the necessary equipment in the well drilling equipments at present. The skill level of shale shaker mainly reflects on handling ability (thruput and separation size )，working stability, the length of service life and operating flexibility. 1 Type of screen motion. 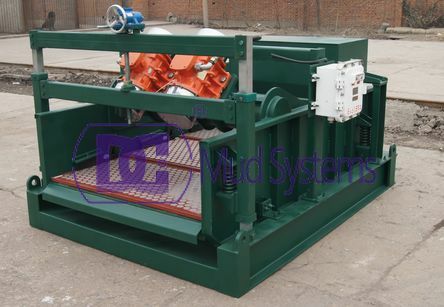 The type of motion of shaker screen will influence the ultimate position of the vibrating assembly relative to the deck of the shaker and the motion track of cuttings. It can be: circular, circular-elliptical or linear. 2 Vibrating amplitude of the screen. 3 Vibrating frequency of the screen. 4 G-force: This is the force imparted by the vibrating system of the shaker to the screen surface to vibrate for solids separation. For conventional shakers G-force = 3 and for strong shakers G-force = 4~6. 5 Mesh and weaving type of screen cloth. 6 Drilling fluid properties such as density, PV, YP and gel strengths. 7 Load of solid on the screen (increases with the increase of pump output and mud solid content). The solid particles which scattered in the drilling fluid called drilling fluid solid phase. In drilling fluid, a part of solid phase is derived from drilling cuttings, and another part is from the added material such as the barite, bentonite. The solid phase can be divided into two categories: useful solid phase and harmful solid phase. Drilling cuttings are the main source of harmful solid phase, and consist in drilling process all the time, thus we must eliminate the harmful solid phase. 1) Block oil gas channel, damage hydrocarbon reservoir. 2) Induce down hole accident. 3) Reduce the service life of equipments. 4) The drilling cost will be increased. Drilling fluid solid phase particles type, size and content are great influence to drilling fluid performance, so we must according to the drilling process requirements do suitable control. In solids control process, the matching of equipments is very important, directly influence the whole solids control effect. The following pictures show the recommended arrangements of the solids control equipment for unweighted and weighted mud systems. 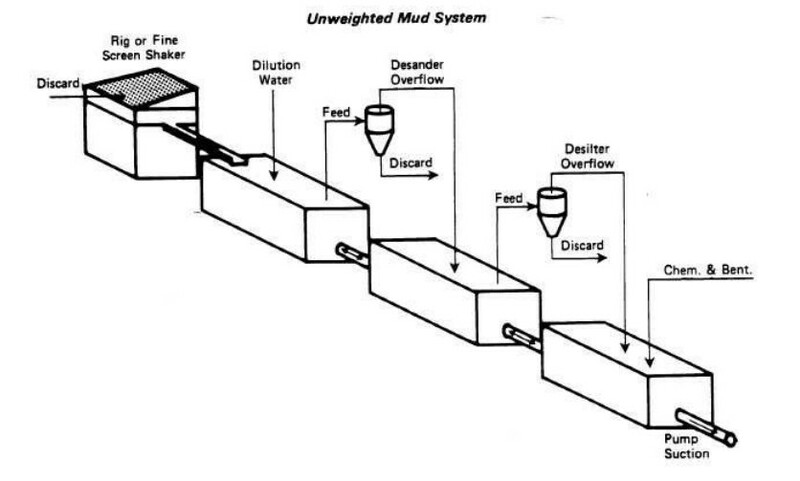 In general, the various pieces of equipment are arranged in decreasing order of their cut points as the mud proceeds downstream from the flowline. Any dilution water used should be introduced ahead of the solids- removal devices in order to improve their separation efficiency. Additions of all other mud materials should be made downstream from the last solids-removal device. The feed and discharge of each device should be separated so that newly processed mud is not fed back to the device. Preferably, the feed and discharge should be in alternate pits. The discharge end of the overflow pipe from a desilter or desander should be above the mud level. If it is not, the separation efficiency will be reduced and mud can siphon back through the cones and out the underflow when the pump is shut down. Hydrocyclones are a broad classification of settling devices that includes the desilter, desander, and clayjector. These are all basically the same device in different sizes which separate solids at different cut points. The mud is pumped into the cyclone through a tangential opening at the large end of the cyclone. This results in a rotating motion of the fluid, much like a water spout. The resulting centrifugal force causes the particles to concentrate at the wall. The dense layer next to the wall travels downward and is ejected at the bottom of the cone. The remainder of the mud travels upward and exits through the overflow end. At the overflow end, a short pipe called the vortex finder extends down into the hydrocyclone past the mud intake. It keeps mud from short-circuiting directly to the overflow. In effect, it taps the light portion of mud in the cyclone, allowing only the dense sludge to spiral down to the underflow. If mud is fed to the cyclone at too high a pressure, some of the mud will exit the overflow without having time for the solids to segregate. If the feed pressure is too low, poor separation of solids occurs. This makes it imperative that the hydrocyclone be operated at the manufacturer’s recommended pressure. Four-inch desilters are generally designed to operate at 40-45 psi, and six-inch desanders at 35-40 psi. After selection of a suitable mud program, consideration should be given to its implementation. The performance of a drilling fluid is determined more by engineering than by the products used. Exotic mud systems, which are not understood by those running them, often result in failure. In selecting a mud company, first consideration should be given to the technical ability of the personnel who will be working the job and the backup support they can expect to receive. There are few instances where the quality and performance of their products are more important than the technical and logistical services that they perform. The cost of products is also important, but should be considered only on a cost-performance basis. 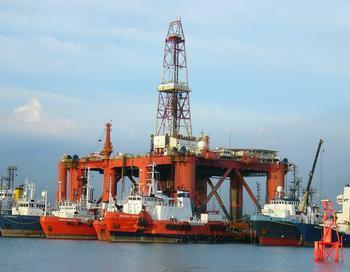 Our objective is to minimize overall drilling, evaluation, and completion costs. Running a mud system consists primarily of controlling the type and amount of solids in the mud and their chemical environment. All mud properties are controlled by controlling these compositional factors. Consequently, an adequate solids control program should be a part of every mud program. The rig mud facilities should be designed to provide for proper arrangement of solids control equipment and mud mixing equipment. Rigs with single mud pits make mud treating and solids control especially ineffective. Inadequate rig mud facilities are often responsible for a considerable amount of lost time, poor mud properties, and increased mud costs. 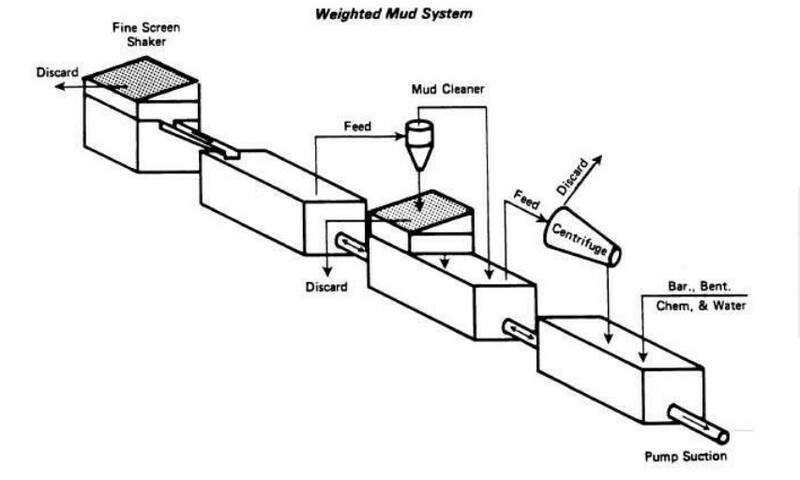 Accurate mud tests are necessary for proper control of the mud properties. Good working conditions for performing these tests are essential. On critical wells, a separate mud trailer would be desirable. In any case, attention should be given to providing adequate, protected space with good lighting. We cannot have a successful drilling operation unless all facets of it are well planned and executed. This includes proper application of the drilling fluid. Every Drilling Superintendent and Drilling Engineer should be knowledgeable in drilling fluid technology and able to apply this technology to the drilling operation. He should be able to evaluate and control the performance of a mud. 1 Bridge: an obstruction in the borehole usually caused by the borehole wall caving in. 2 Building assembly: a BHA specially designed to increase the inclination (drift angle) of the wellbore. 3 Build up rate: the rate at which drift angle is increasing as the wellbore is being deviated from vertical. Usually measured in degrees per 1 foot drilled. 4 Build up section: that part of the wellbore’s trajectory where the drift angle is increasing. 5 Bumper sub: a drilling tool,placed in the BHA, consisting of a short stroke slipjoint which allows a more constant WOB to be applied when drilling from afloating rig. 6 Cable tool drilling: an earlier method of drilling used before the introduction of modern rotary methods. The bit was not rotated but reciprocated by means of a strong wire rope. 7 Cap rock: an impermeable layer of rock overlying an oil or gas reservoir and preventing the migration of fluids. 8 Cased hole: that part of the hole which is supported by a casing which has been run and cemented in place. 9 Casing: large diameter steel pipe which is used to line the hole during drilling operations. 10 Casing head Housing: a large recepticle which is installed on top of the surface casing string. It has an upper flanged connection. Once it is installed it provides: a landing shoulder for the next casing string: and a flanged connection for the BOP stack to be connected to the well. Compared with drilling on ground, the offshore drilling has higher requirement about the solids control equipment. 1 Drilling mud tank should contain the maximum circulating volume of drilling fluid in drilling process. 2 The whole intensity of mud tank should satisfy the demands of hoisting, transport and using drilling fluid with 2.5g/cm³. 3 According to the requirement of technological process, between each cabins should be installed overfall and communicating pipe. 4 Every bay should be installed cleaning port, the lower edge of the opening should be leveled with tank bottom, and can be below the tank bottom. 5 All of the sealing elements needed to satisfy oil resistance, acid-resisting, alkali-resisting, and H2S resistance, and can meet the requirement of using all kinds of drilling fluid. 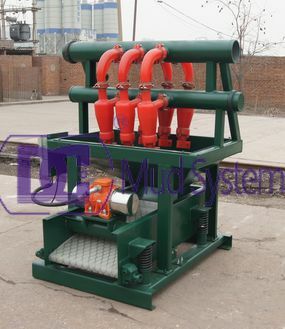 1 Shale shaker: the handling capacity should be 100%~125% of the maximum total displacement of drilling pump. 2 Degasser: the handling capacity should be 100%~125% of the maximum total displacement of drilling pump. 3 Desander: the handling capacity should be 100%~125% of the maximum total displacement of drilling pump, and the matched centrifugal pump and the motor should satisfy the above capacity. 4 Desilter: the handling capacity should be 100%~125% of the maximum total displacement of drilling pump, and the matched centrifugal pump and the motor should satisfy the above capacity. 5 Centrifuge: the handling capacity should be 5%~10% of maximum delivery in drilling process. CNQ100×4 Desilter is the third class equipment in solids control system, it is the combination of desilter and shale shaker. Desilter is designed by the theory of particle sedimentation. 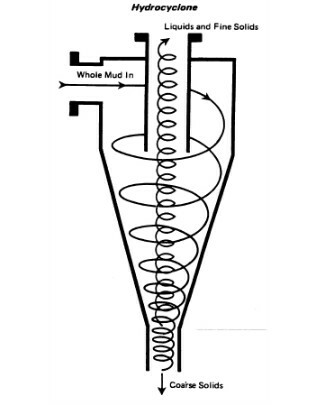 The separation medium-drilling fluid produces some pressure and speed when it passes the centrifugal pump, and flows into the hydrocyclone along the wall, the bigger solid particles along the wall of hydrocyclone sink spirally under the centrifugal force and gravity, and to be discharged from the bottom flow hole and fall on the under micromeshsieve for separation. The other mediums rise along the spiral of hydrocyclone, flow into the fourth class separation equipment-centrifuge for a further cleaning treatment from the overflow hole. Desilter is mainly composed of shale shaker, hydrocyclones, etc. The liquid outlet of centrifugal pump and the liquid inlet pipe bend of desilter should be connected with pipes, the liquid inlet pipe bend can be rotated any angle around the vertical axis, the overflow pipe both ends of desilter are symmetrical, all can be the overflow end. 2. Under ideal working state the spouting angle at the bottom will be 20°～30°. 3. No load running should be going for 5~15 minutes after every halt of pump running, with screen cloth cleanly washed in clear water. And it is especially to do so when slurry having big viscosity to be processed with close-mesh screen for processing effect will be impacted because the meshes are blocked by sticky substance and silver sand. 4. After the equipment has run up to 4000hours, the wearing parts including cone-shaped canister and spiral case, etc. should be checked or replaced. Why we should install Jet Mud Mixer correctly? Why the installation of Jet mud mixer is very important? 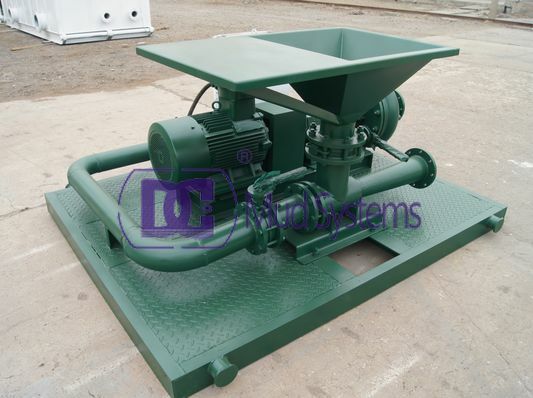 Jet mud mixer can work effectively, but the jet mud mixer unreasonable installation will cause a lot of problems. The low add speed will increase the drilling time and the time of processing drilling fluid. If the mixture discharged from jet mud mixer enters into the tank which no suitable agitator device, even if the hopper disperses and wetting material fully, also can make a lot of solid particles precipitate. If we can choose, install and debug charging system correctly, the work load of whole system maintenance will be reduced, the drilling fluid cost will be decreased, the working hours of treating drilling fluid also will be reduced. How to install and choose the Jet mud mixer correctly? 1 Need to satisfy the requirement of proportioning at scene. General requirements mixing hopper capacity shall not be less than 150m3/h. For the larger tank and great pump motor power, we can also use the mixing hopper with 300m3/h capacity. In order to ensure the required well pressure, suggest that each drilling crew should equipped with a spare set of mixing hoppers, in most cases spare hoppers used overlap mode. 2 The return pressure of outlet pipe needed moderate, overlarge return pressure will reduce the treating capacity of mixed hopper. 3 The gap between nozzle and venturi tube must be suitable, when reach optimum efficiency, the gap is 32~90mm, usually don’t more than 90 mm, otherwise the feed speed of barite will be significantly reduced. 4 Another important consideration of install equipment is the drilling fluid required lifted height. If discharge needed to enter into different deck tank or a taunt tank and hopper, mix rate will be decreased. When the height from 1.83m to 3.66m, barite adding rate will be reduced to 17%. If the increased demand is very high, the pump capacity is insufficient, mixed ability will be greatly reduced.